He served in the Senate from 1966 to 2005 and was instrumental in enacting laws to alleviate childhood hunger and expand competition in telecommunications when the Internet was starting out. Ernest F. “Fritz” Hollings, who as South Carolina governor in the early 1960s oversaw the orderly desegregation of schools and then as a U.S. senator for 38 years was known for his attempts to balance the federal budget and for his sharp, often caustic tongue, died April 6 in Isle of Plams, S.C. He was 97. His death was announced by Andy Brack, a family spokesman. Complete details were not immediately available. The silver-haired Senate stalwart, a Citadel graduate and World War II veteran, was perhaps best known as an author of the Gramm-Rudman-Hollings Balanced Budget Act of 1985, a noteworthy effort by Congress to compel federal budget reductions. He served in the Senate from 1966 to 2005 and was instrumental in enacting laws to alleviate childhood hunger, increase vehicle efficiency after the Arab oil embargo, and expand competition in telecommunications when the Internet was in its infancy. He also drew attention for the unpredictable candor with which he expressed himself in his deep Southern drawl. His Charleston accent was so thick that Sen. Edward Kennedy of Massachusetts, a close friend and fellow Democrat, once jovially introduced him as the first non-English-speaking candidate for president. Hollings sought his party’s presidential nomination in 1984 but failed to garner much support with his “take your fiscal medicine” message. He dropped out of the race after finishing sixth in the New Hampshire primary, behind Sen. Gary Hart of Colorado, former Vice President Walter Mondale, Sen. John Glenn of Ohio, Jesse Jackson and former Sen. George McGovern of South Dakota. He also saved a barb for himself. 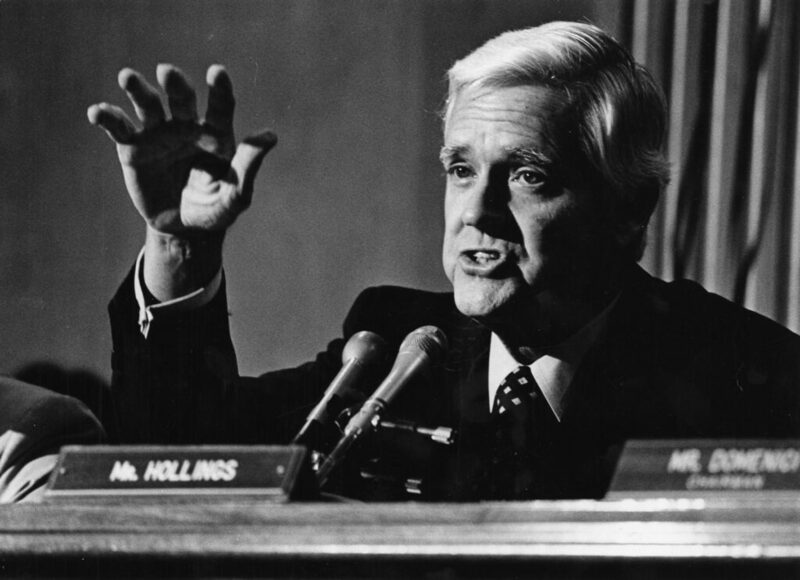 Hollings had the distinction of being the longest-serving junior U.S. senator in history on Capitol Hill, where he was outranked for much of his tenure by Strom Thurmond, a wily political survivor who transitioned during his lengthy career from an anti-integration Democrat to a Republican. Like Thurmond, Hollings began his career in an Old South dominated by the Democratic Party and ended it in a New South decidedly partial to Republicans. He gradually moved to the center, walking an occasionally treacherous path between political accommodation and principle. As governor from 1959 to 1963, he was determined to prevent an outbreak of violence over public school integration mandated by the U.S. Supreme Court’s landmark decision in Brown v. Board of Education. Although he opposed integration at the time, Hollings, unlike many other Southern governors, achieved a peaceful transition. In the Senate, Hollings continued his journey away from the politics of Jim Crow. In 1967, he voted against the U.S. Supreme Court nomination of Thurgood Marshall, who became the court’s first black justice, but he later explained, “It was politics, not racism.” In 1991, he supported the nomination of another African American – Clarence Thomas – to the high court. In the meantime, he became generally supportive of civil rights legislation. Winning term after term, Hollings became chairman of the Budget Committee, chairman of the Commerce, Science and Transportation Committee, and a senior member of the powerful Committee on Appropriations. He used his clout and legislative prowess to build personal alliances, defend South Carolina’s diminishing textile industry and bring new industries to the state. He insisted that his opposition to free-trade pacts was not protectionism for the South’s textile industry but rather an effort to prevent jobs from going overseas. As his profile rose, his abrasive remarks drew increasingly intense criticism in the national media. Amid a trade dispute with Japan in 1992, Hollings told a gathering of workers in Hartsville, South Carolina, that they “should draw a mushroom cloud and put underneath it: ‘Made in America by lazy and illiterate workers and tested in Japan.’ ” The senator was alluding to the atomic bombs that the United States dropped on Japan to end World War II. Hollings’ off-the-cuff remarks, while polarizing, appealed to many voters who saw him as a fearless spokesman in an era of stifling political correctness. Ernest Frederick Hollings was born Jan. 1, 1922, in Charleston, where his family owned a paper mill. After graduating in 1942 from The Citadel, a military college in Charleston, he served as an Army artillery officer during World War II, taking part in five battle campaigns, from North Africa to Central Europe. His decorations included the Bronze Star Medal. Hollings received a law degree from the University of South Carolina in 1947 and served in the South Carolina House of Representatives before he was elected lieutenant governor in 1954. He was elected governor in 1958, at 36. The jovial, impeccably tailored Hollings was a frequent traveler to Wall Street, Latin America and Europe, where he pitched investment in a nonunion state with a triple-A credit rating. In one marathon week in New York, he signed up 63 companies – including 17 at one lunch – to open plants in his home state. One major political test involved the desegregation of public education in South Carolina. Throughout his early political career, Hollings had opposed integration of the state’s public schools. But he had also taken strong positions against racial violence, and before leaving office in 1963 he was ready to concede that resistance to school integration was a lost cause. In his last address to the state’s General Assembly, he implored legislators to allow South Carolina schools to be integrated peacefully. Political advisers urged Hollings to avoid becoming involved in the case of Harvey Gantt, a black student who transferred to all-white Clemson University in 1963. Hollings sent word to U.S. Attorney General Robert F. Kennedy that the state would keep order and wanted no federal marshals or troops dispatched to South Carolina. Gantt, who years later became the first black mayor of Charlotte, North Carolina, and a Democratic Party power broker, registered at Clemson with no picketing or jeering soon after Hollings stepped down as governor. Hollings’ first attempt to win election to the U.S. Senate failed in 1962, when he tried to unseat Olin D. Johnston, an old-style Southern populist, in the Democratic primary. After Johnston died in 1965, Hollings filled out the remaining two years of his term. He won a full term in 1968 and was reelected five times. His early years in the Senate were marked by a high-profile war on hunger in South Carolina. His efforts includeda book called “The Case Against Hunger” (1970). He encouraged the expansion of the federal food stamp program and helped sponsor legislation that established the Special Supplemental Food Program for Women, Infants and Children, commonly known as WIC. Hollings was also considered a legislative father of the National Oceanic and Atmospheric Administration, which was established in 1970. For years, he worked on conservation and preservation efforts to protect coastal and marine life. He became perhaps best known as a co-author – with Sens. Phil Gramm, R-Texas, and Warren Rudman, R-N.H. – of the Gramm-Rudman-Hollings act, which called for a balanced federal budget within six years. Among other measures, the legislation introduced automatic cuts, called sequestrations, to be applied if spending limits were not met. Ultimately, conservatives and liberals failed to agree on ways to achieve substantial spending cuts, a key provision was ruled unconstitutional and the law was overtaken by other legislation. But it was credited with curbing deficit growth for a period. His first marriage, to Patricia Salley, ended in divorce. He subsequently was married to Rita “Peatsy” Liddy from 1971 until her death in 2012. Survivors include three children from his first marriage, Michael Hollings and Ernest F. “Fritzie” Hollings III and Helen Hayne Reardon; and several grandchildren. A daughter, Salley Hollings, died in 2003. After Thurmond’s death in 2003 at 100, Hollings became South Carolina’s senior senator. He soon announced his decision to retire from public life and did not seek re-elelction in 2004.